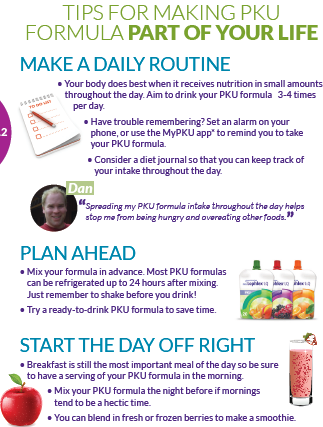 PKU is Diet-for-Life. It’s Never Too Late to go back on diet. 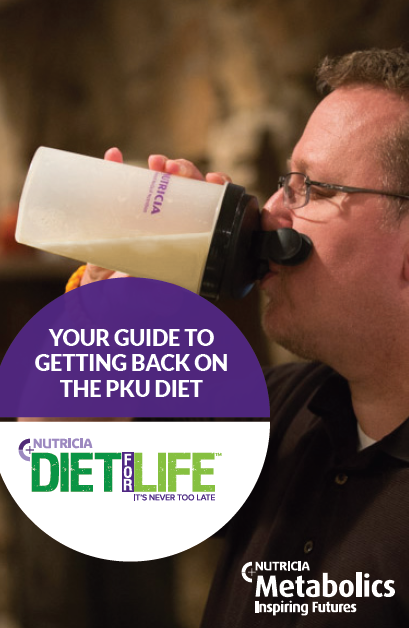 Request a free copy of this helpful booklet “Your Guide to Getting Back on the PKU diet” and help yourself or someone you love get re-started on the PKU diet today! PKU is short for Phenyketonuria. PKU is a genetic disorder that a child inherits from both parents. For a child to be born with PKU both parents must either be carriers of PKU or have PKU, which means they carry at least one PKU gene. 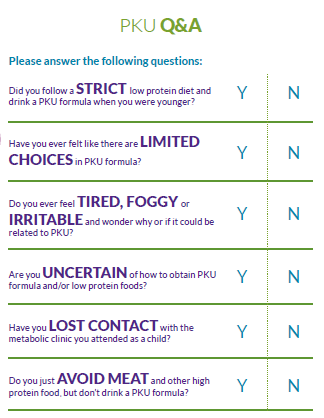 PKU occurs due to a deficiency or absence of the enzyme phenylalanine hydroxylase (PAH), which interferes with a person’s ability to metabolize or process the amino acid phenylalanine (PHE) into tyrosine, another amino acid. Amino acids, like PHE, are the building blocks of protein found in food and the human body. Consuming too much PHE from food can lead to a toxic build-up of PHE in the blood and brain of a person with PKU. Without treatment, this buildup of PHE will cause irreversible brain damage. Presently, there is no cure for PKU, but it can be managed effectively with proper diet and special nutritional formulas designed for persons with PKU. View products. In order for an individual to have PKU, both parents must pass along their PKU gene to their child. When both parents are carriers of PKU, there is 1 in 4 chance with each pregnancy that the child will have PKU, 1 in 2 chance of the child being a carrier, and 1 in 4 chance that the child will neither have PKU nor be a carrier. It is estimated that one out of 10,000 live births has decreased PAH activity(1). Autosomal Recessive Inheritance Normal Gene Carrier Non Carrier Carrier Carrier PKU Carrier PKU Gene Phenylketonuria (PKU) *Phenotype- observable traits, outward appearances, development or behavior. Newborn screening for PKU began in the US and Canada in the 1960s. It is important that an infant is diagnosed and managed with diet within days after birth to prevent permanent negative effects from PKU. 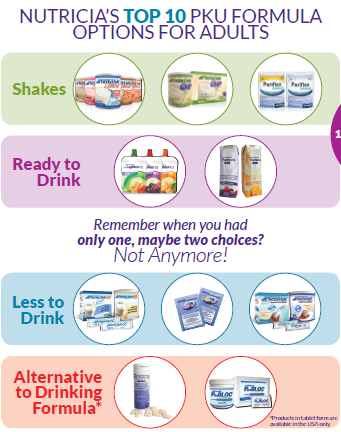 Nutricia is proud to offer the largest variety of great tasting formula options for people with PKU. Learn more online at MedicalFood.com or contact us at (800) 605-0410 for free product samples. Your metabolic dietitian will help you decide which products are right for you. PKU formula must be used under medical supervision. 1. Vockley J, Andersson HC, Antshel KM, et al. Phenylalanine hydroxylase deficiency: diagnosis and management guideline. Genet Med. 2014;16(2):188-200.